Last Thursday after yoga class, my friend Martha said she had something for me. As we walked out the door, she pulled from her pocket a little baggie holding a single, coconut-dusted ball, which she handed to me, and which I ate immediately. The little treasure disappeared quickly, but I played my favorite game—guess what’s in it!—even so, identifying coconut, lemon, and dates. When I got stumped, Martha filled in the blanks: ginger, vanilla, and coconut manna, also known as coconut butter, an ingredient I had never before used. 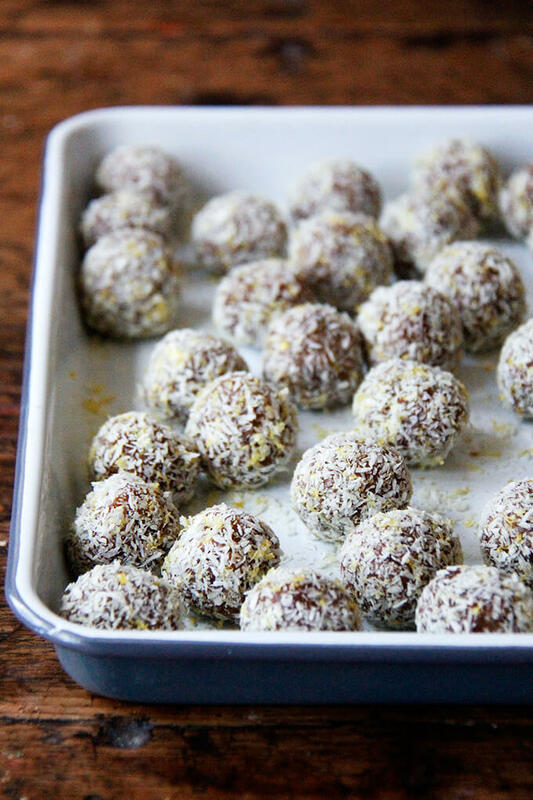 Coconut butter was new to Martha as well, but after spotting the recipe for these “lemon pie” date balls in The Autoimmune Wellness Handbook, she made the trek to Honest Weight Food Co-op for the manna and hasn’t looked back since. Neither have I. 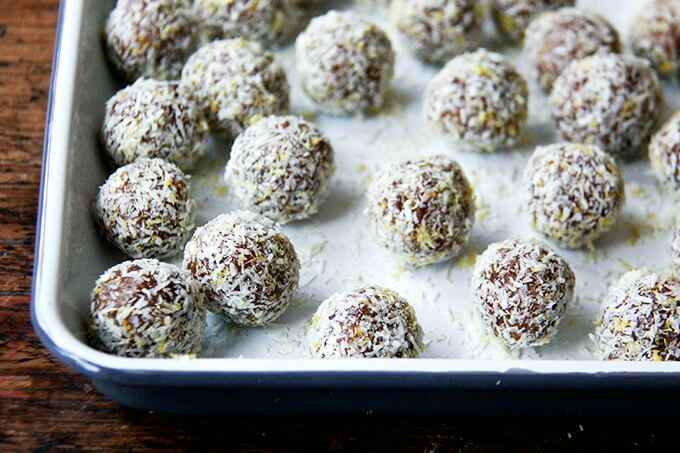 These no-cook date balls are so tasty and easy to throw together, too: purée pitted dates, coconut butter, ginger (fresh or powdered), fresh lemon juice, and vanilla (bean or extract) in a food processor; portion the mixture into balls; then roll the balls to coat in a mix of shredded coconut, lemon zest, and sea salt, which is incredibly delicious and pretty to boot. Per Martha’s suggestion, I store these balls in the freezer and find it nearly impossible to walk by without sneaking one. They’re not too sweet, nicely chewy, and completely satisfying. I think you’ll approve. Have a wonderful weekend, Everyone. 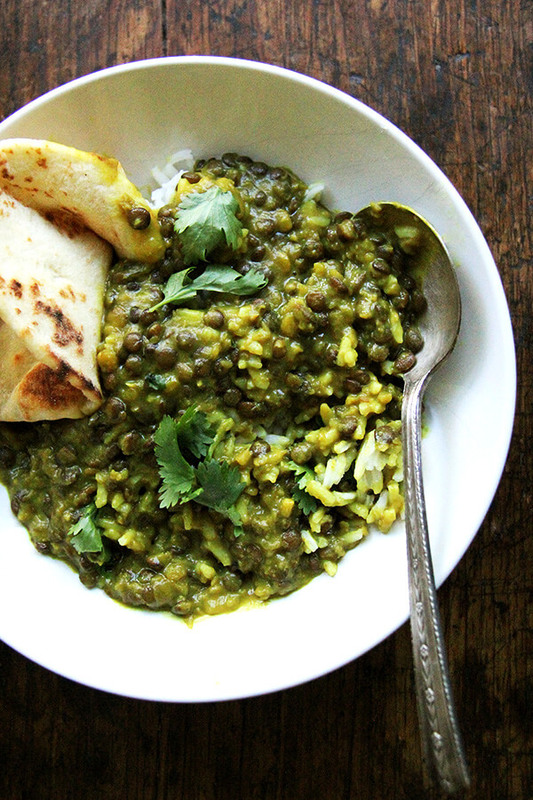 This recipe has been adapted from The Autoimmune Wellness Handbook. You will need coconut manna also known as coconut butter, which is a new ingredient for me. I ordered mine from Amazon, but your favorite local health food store likely will carry it. 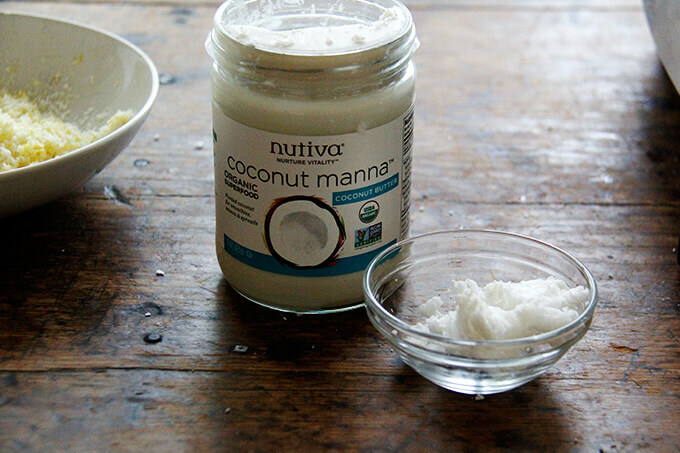 How, you might be wondering, does coconut manna differ from coconut oil? Coconut oil is the oil that has been extracted from the coconut meat, whereas coconut butter is made from the flesh that has been ground into a spreadable paste. 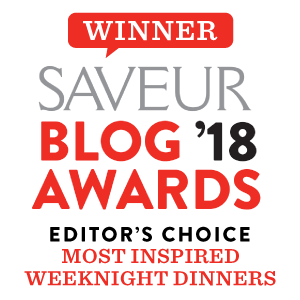 You can read more about the difference between the two on The Kitchn, but if you’re wondering if you can substitute coconut oil for the butter, I can’t really say because I have not tried. 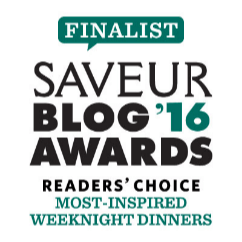 The Kitchn does not recommend substituting one for one another. They suggest using coconut oil for cooking (sautéting, roasting, and baking), and using coconut butter with foods that are already cooked. 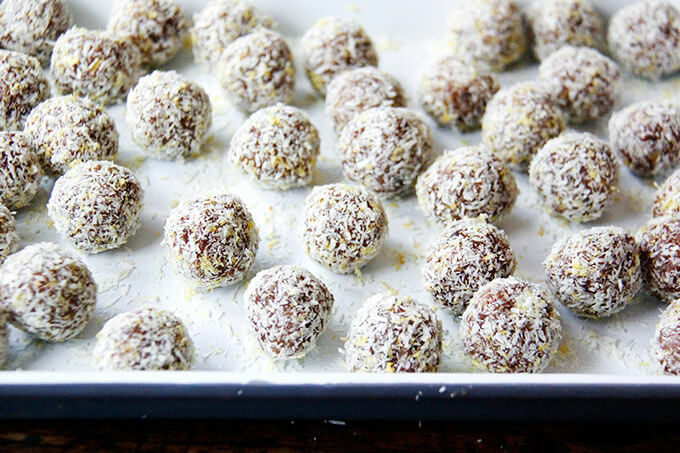 These date balls are raw, however, so coconut oil (unmelted) might be fine? If you give it a go, let me know. Notes from The Autoimmune Wellness Handbook: In order to measure the coconut concentrate, it is best to soften it in a warm-water bath before use, as it is solid at room temperature. (I did not do this.) If you find yourself sensitive to vanilla bean seeds, scrape out the seeds and just use the pod. 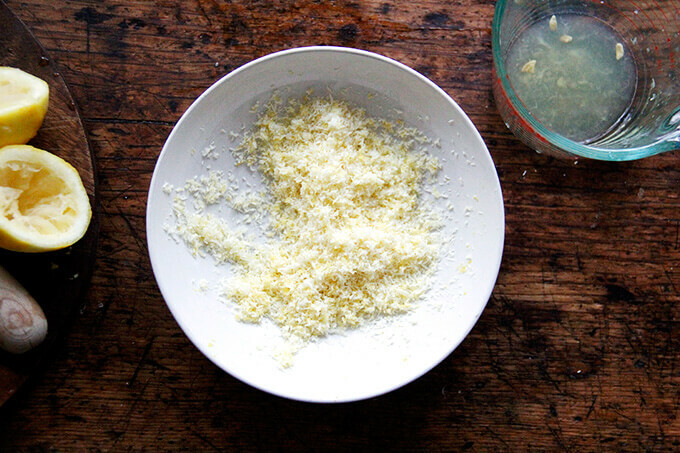 Combine the lemon zest, coconut flakes, and sea salt in a shallow bowl and set aside. Combine the remaining ingredients in a food processor, and pulse to process until a “ball” forms. 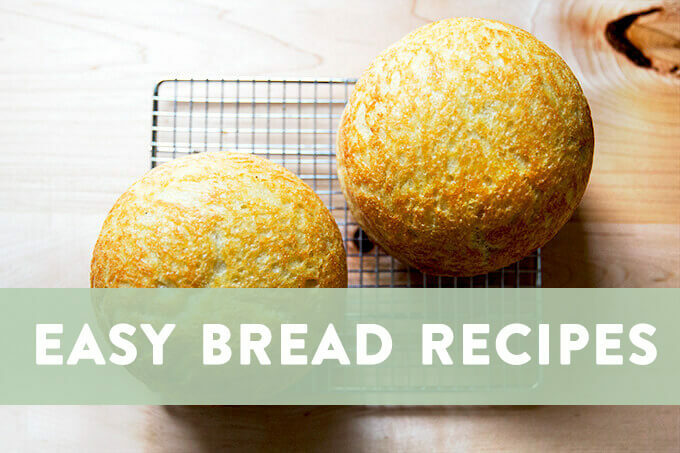 If the mixture is still too dry, add 1 tsp of water at a time until it does form a ball. 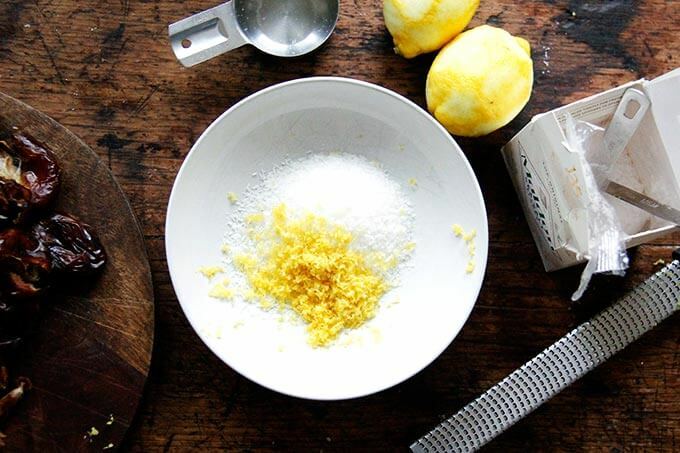 Roll the mixture into approximately 25 to 30 small balls—I use a #100 scoop for this—then roll through the lemon zest mixture to coat. Place on a plate, and transfer to the freezer for 5 minutes to harden. Then transfer to an airtight container for storage in the refrigerator or freezer—I store in the freezer in a quart container. Can you substitute the dates or do you have to use them at all? If so, what would be a great substitute? Hi Gloria, The dates provide nearly all the substance for these balls. Do you not like dates? Or do you have a hard time finding them? I’m just not sure what could work in their place?? 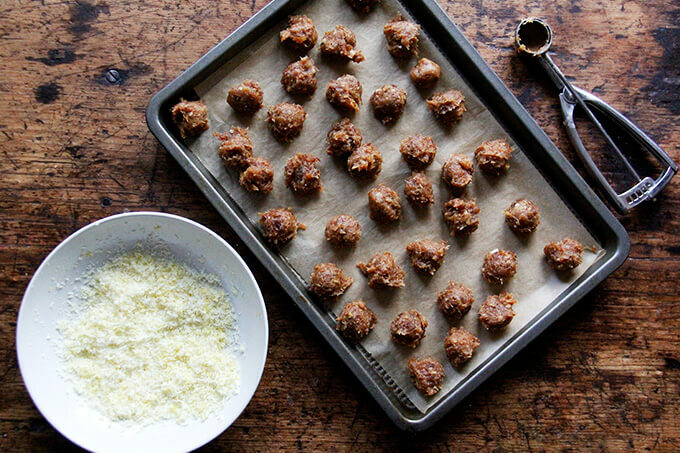 You probably could use dried figs or unsulfured apricots. 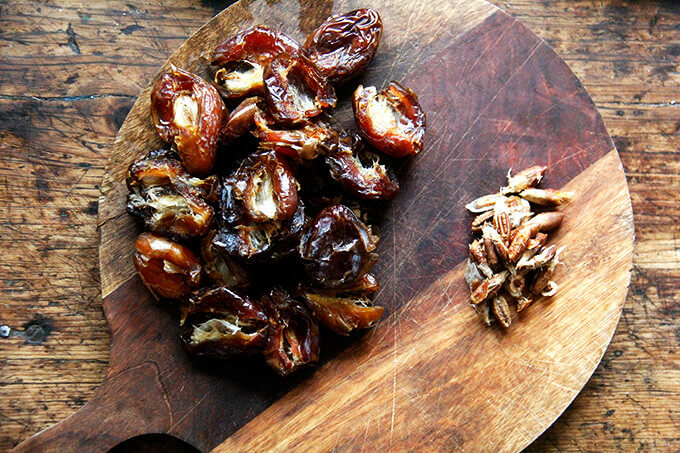 I would soak both a bit since they tend to be drier than dates. 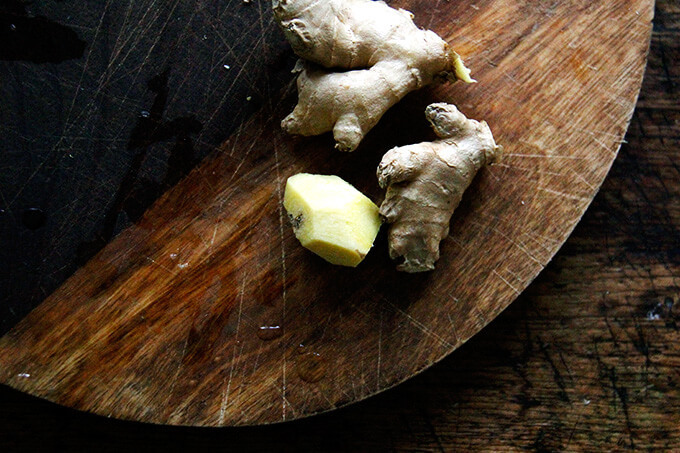 The flavor will be different but the texture should work. 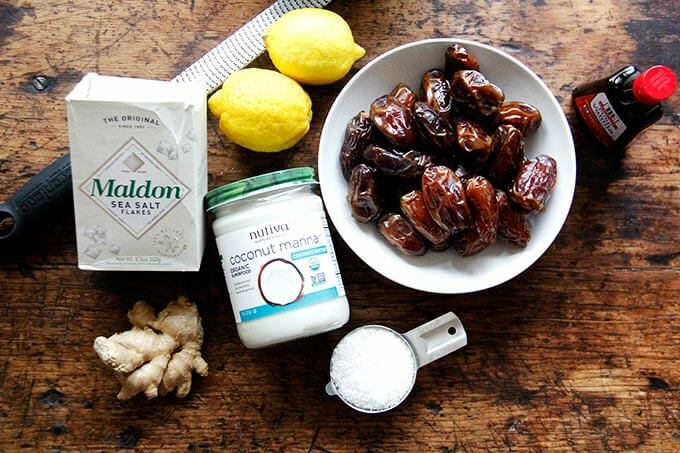 Can you use coconut oil instand of coconut butter? I really can’t say for sure bc I’ve never tried, and I would hate for you to go through the effort of making these only to have them not turn out well. 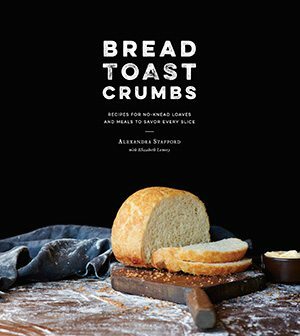 Ali, I used to smear coconut manna on your oatmeal maple bread toast foe a while. Yummy! Made them! I think maybe my dates were not as soft because I needed to double the lemon juice and manna (which was liquid since I needed to mix it). I nearly broke my food processor it was so thick! Worth it though (and it didn’t break lol just smoked a little. Not kidding)! Wow these are really tasty. Thanks for posting. 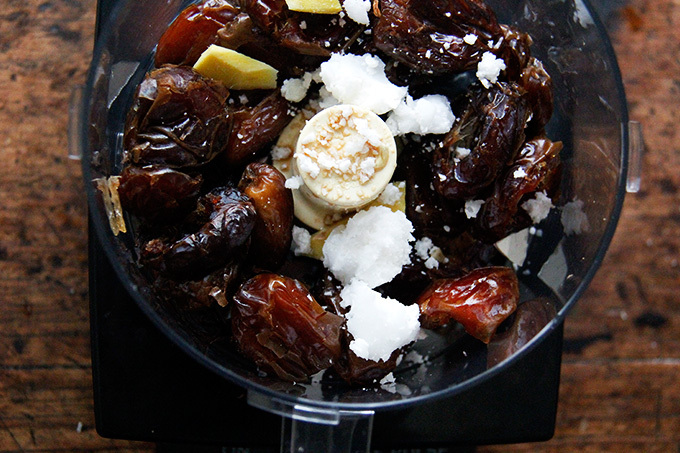 Almost all dry dates need to be soaked before blending- pour boiling water over the dates and once water has cooked drain them and proceed. Otherwise yeah, it’s a great way to break a food processor! These look amazing! Can’t wait to try the recipe! 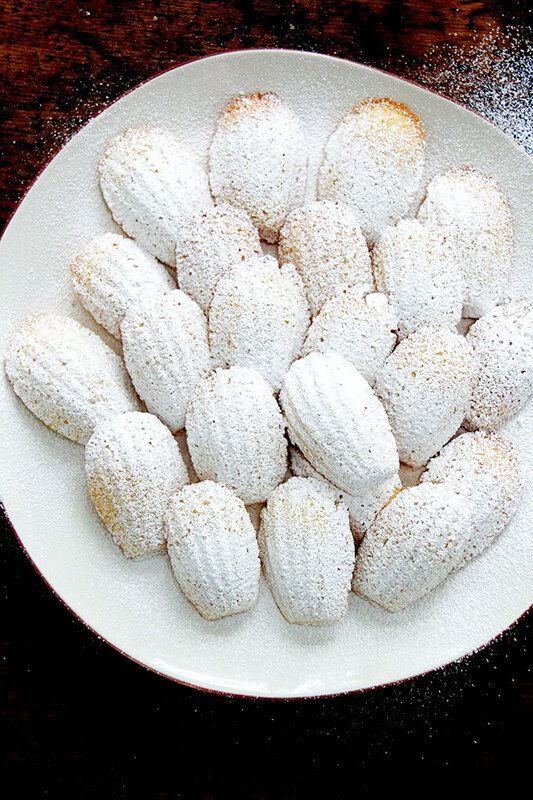 I love those foods which are made with coconut. And I also love Date! Fruit! This balls looking yummy and so delicious. Thanks for sharing! Yum! Tried them this weekend using 28 dates from TJ’s that I had to pit before using. I added about a tablespoon of water to the mixture and that seemed about right (I didn’t heat the coconut butter which would have helped); I did use vanilla extract so that added to the liquidity. Super yummy – I enjoyed the mix right out of the bowl as much as after the balls were firmed up in the freezer. One note I made on the recipe I printed — next time I’ll make more of the coating mixture as I ran out (I may have made different size balls). 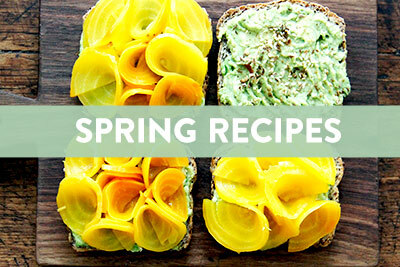 Thanks for sharing — loving these as they remind me of spring and summer to come! 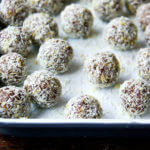 I make date based energy balls all the time, this combo sounds delicious!! 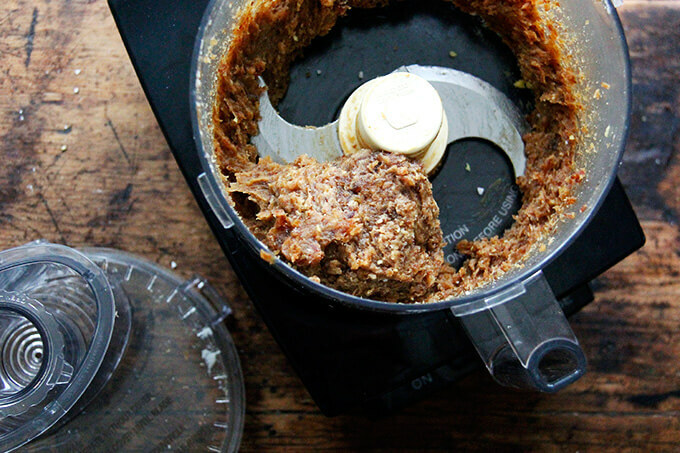 Coconut butter can be expensive but it’s easy to make with a food processor- literally just unsweetened coconut flakes that you pulse them blend into butter. Keeps in the fridge a few weeks or you can freeze it too. YUM. I bought a jar of coconut manna specially to make these after seeing the recipe a while back, but I kept putting it on our morning oatmeal and realized the jar was about to be empty and still no balls! Glad I used the last couple tbsp to make these, they’re great! Thanks for the reminder on quickles too. I have just put a jar of kohlrabi ones in the fridge. Have you made kohlrabi fries? A woman at the farmer’s market told me that’s what she likes to do with them. Gonna try that soon! 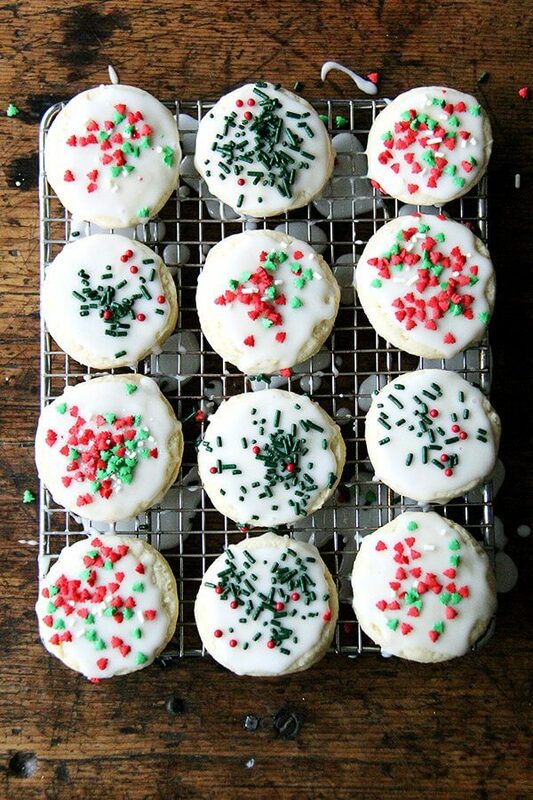 These are really great, I’ve been making double batches. And yet, I still have so much coconut manna left. Any ideas for other uses or variations on this? Lol, thank you! I guess it’s fine, maybe if I stick it in the freezer I’ll feel less anxious about it sitting around too.